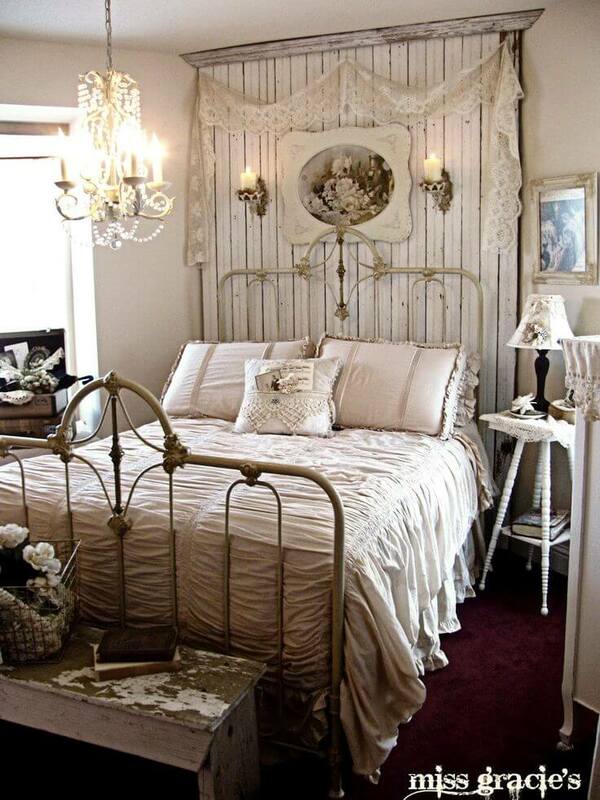 Shabby chic bedroom designs give your space a cozy, homey feeling. Their combination of feminine touches and rustic, vintage accents makes your room look truly unique! The list of shabby chic bedroom ideas below has tons of DIYs and inspiration for turning your bedroom from plain to quaint. 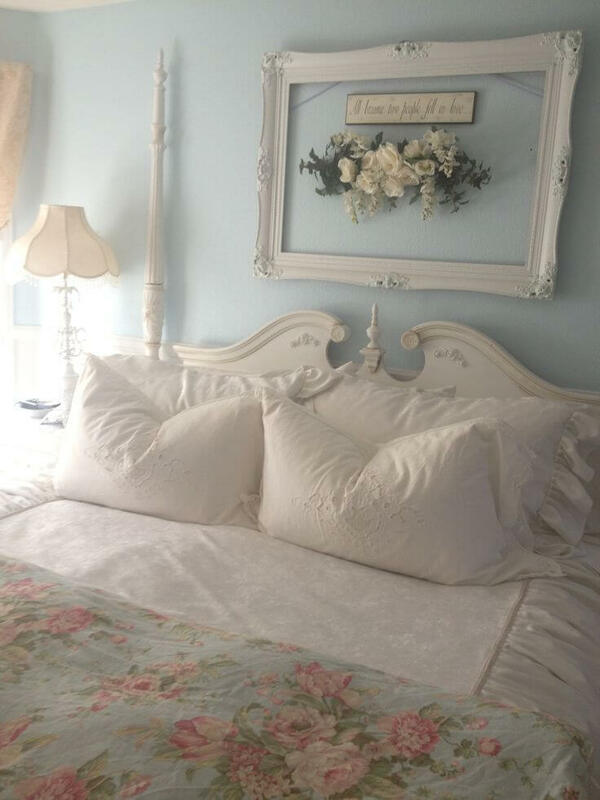 Looking for some shabby chic bedroom ideas for new linens? You will find lots of pretty fabrics, ruffles, lace, and soft hues. If you want to save money while really giving your space a vintage feel, try making some of the DIY projects on this list. From upcycled chairs and suitcases to repurposed tables and birdcages, your room will have a pretty antique look that is unique to you! 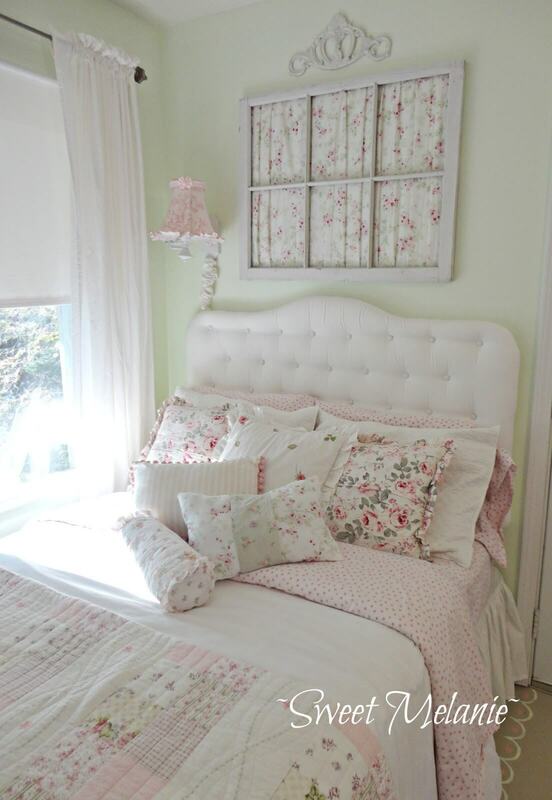 Shabby chic bedroom designs usually feature lots of pretty roses, peonies, and other flowers. That is why this list of shabby chic bedroom decorations has so many tutorials and looks that will give your space the feeling of a cottage with a garden. Though many of these ideas would look best in an adult bedroom, many would also be cute in a little girl’s room or nursery or even a sitting room. 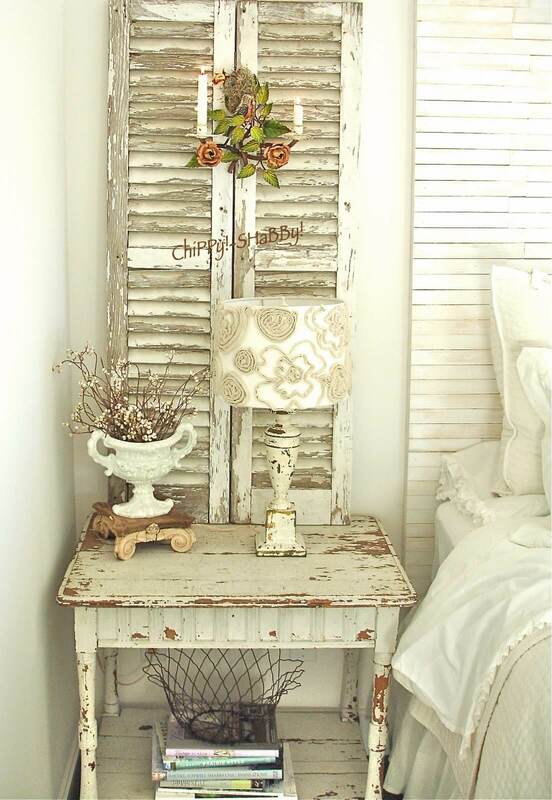 Read on for DIY tutorials for shabby chic bedrooms and other inspiration! 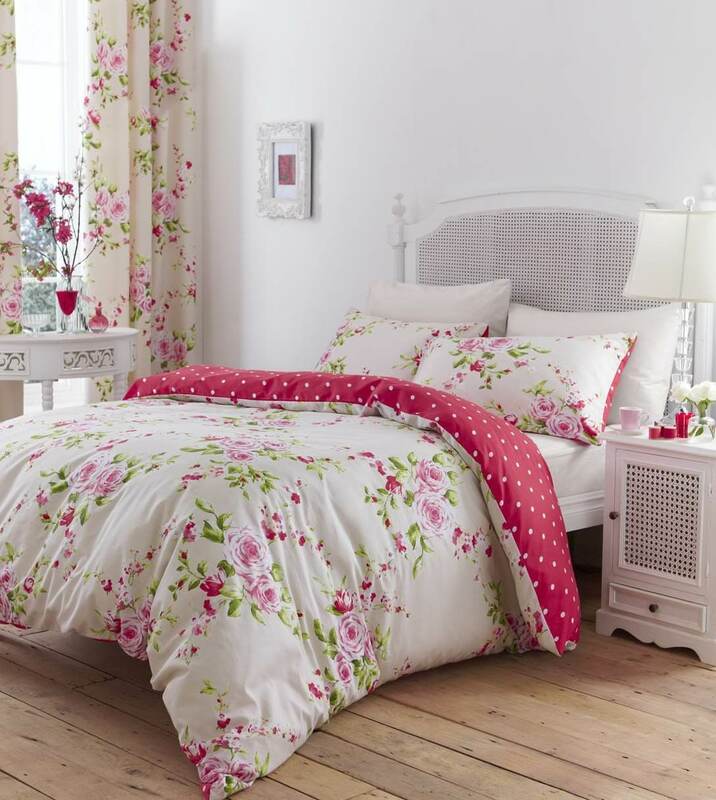 Bring springtime to your bedroom all year long with a bedding set that is sprinkled with pink peonies. The red and cream polka dot pattern on the underside of the duvet gives the design a fun twist. The matching curtains and variety of pretty vases with complementing flowers finish off the bedroom’s bright and fresh look. 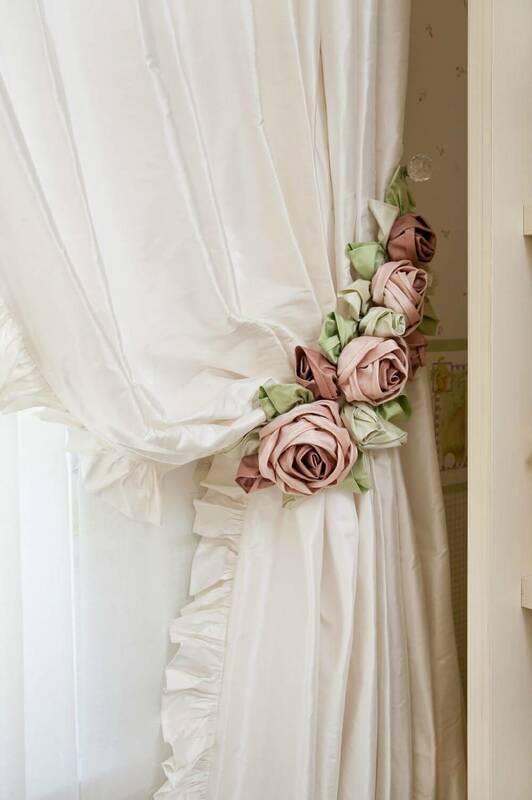 If you have a lot of white accent linens in your bedroom, bring in a touch of elegance and color with this silk rose curtain tie back. The dusty color of the roses give them a vintage and delicate look making it a perfect accent in a little girl’s room or nursery. 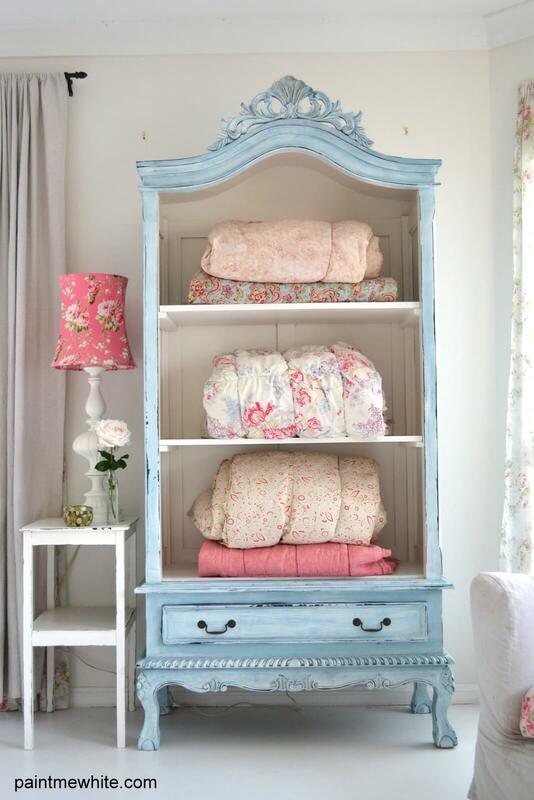 Create a vintage place to display all of your pretty linens with this upcycled amoire. To achieve this look, paint an old armoire with a light blue color, then run a dry brush with a little bit of white paint all over the surface. For a more distressed look, sand down the amoire after painting. 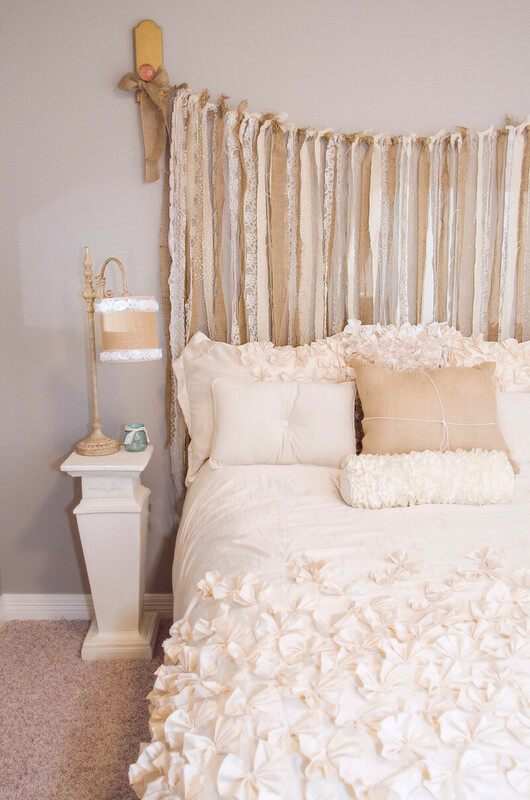 Give your shabby chic bedroom some texture with this combination of lace and burlap. Create your own headboard using alternating ribbons of lace and burlap secured with doorknobs made of pink glass. Burlap lamps adorned with white rosettes placed on elegant pedestal tables, and a textured bedspread with burlap accent pillows complete the look. Repurpose a set of antique, vintage suitcases into a unique bedside table. 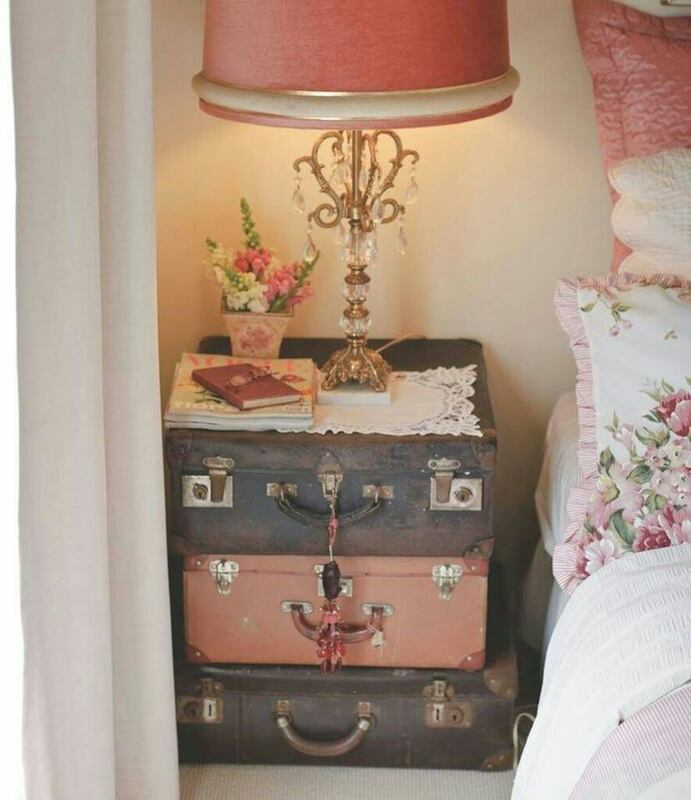 Hang a few pink crystal accents from the pulls of the suitcases for a bit of glamour. Top the suitcases with a lace doily, a pretty crystal lamp with a pink lampshade, and a simple vase with flowers to enhance the elegance of the design. 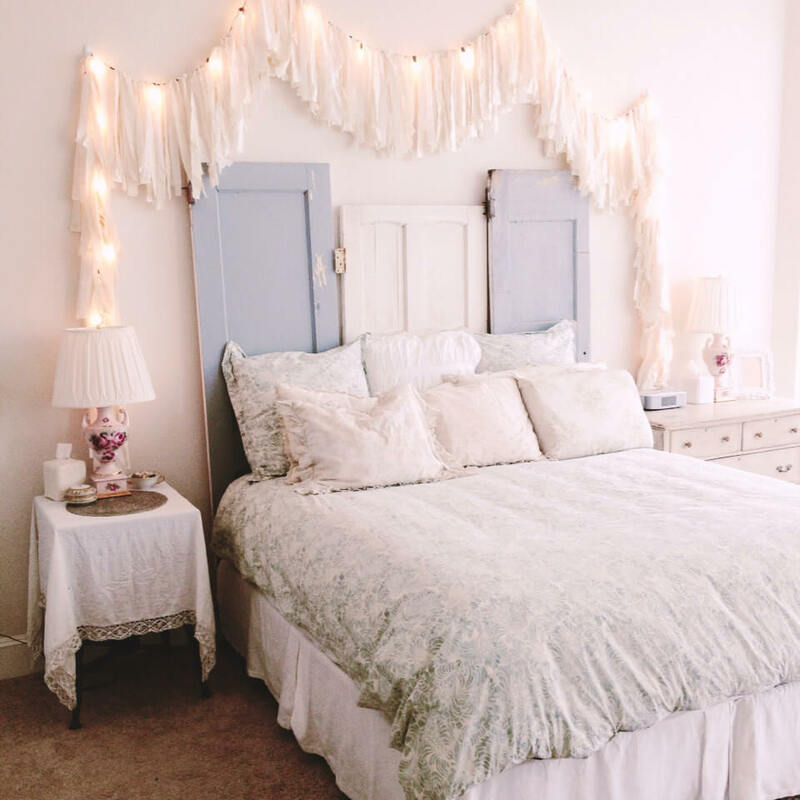 Make an old birdcage into a source of soft and romantic lighting in your bedroom. 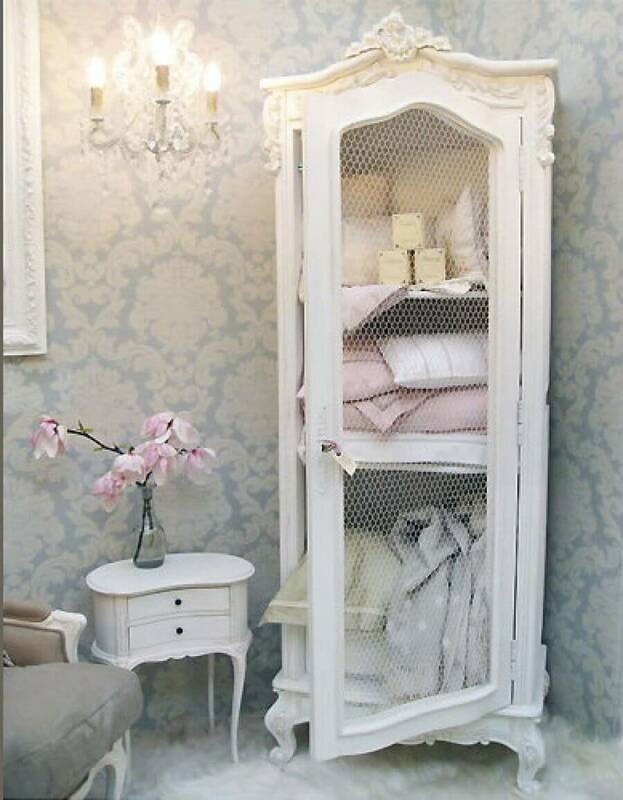 Paint the birdcage white for a classic look, or choose a different light color to match your bedroom decor. To finish the look, adhere string lights in random places inside and outside of the birdcage. If you want to add a touch of shabby chic design to your modern bedroom decor, this hope chest is the ideal choice for you. The sweet pink color and simple elegant design bring a bit of glamour to your bed. 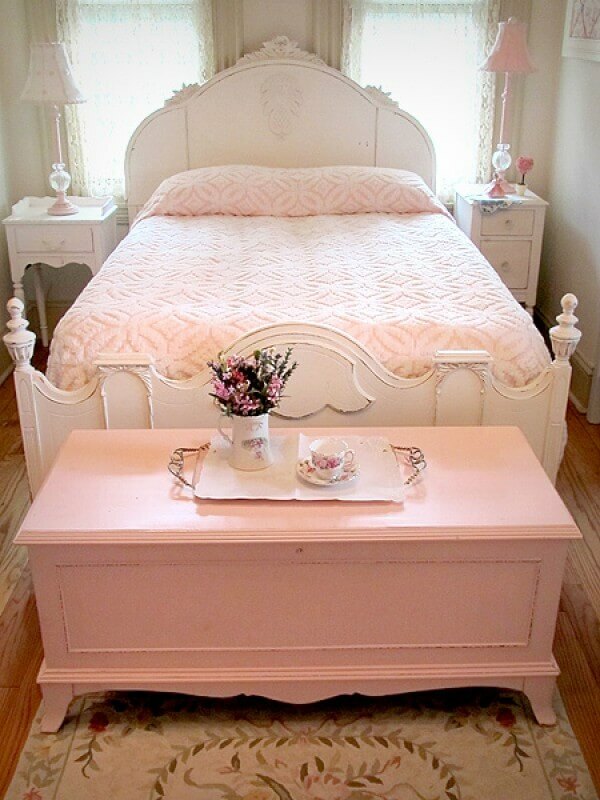 This hope chest also works as the accent to a bedroom completely done in a shabby chic style. 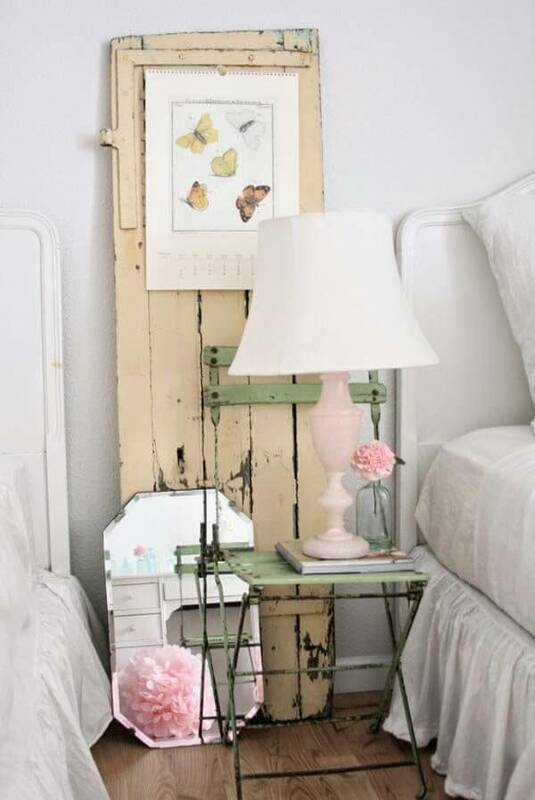 Give a beautiful antique frame a makeover by giving it a coat of light pink and white paint, and sanding it for a slightly distressed look. Use the frame as a simple decor item in your bedroom, or insert a mirror to give the decor piece function in your room. If you do not have a ton of extra space in your bedroom, this antique desk can serve as an end table, desk and vintage decor piece. 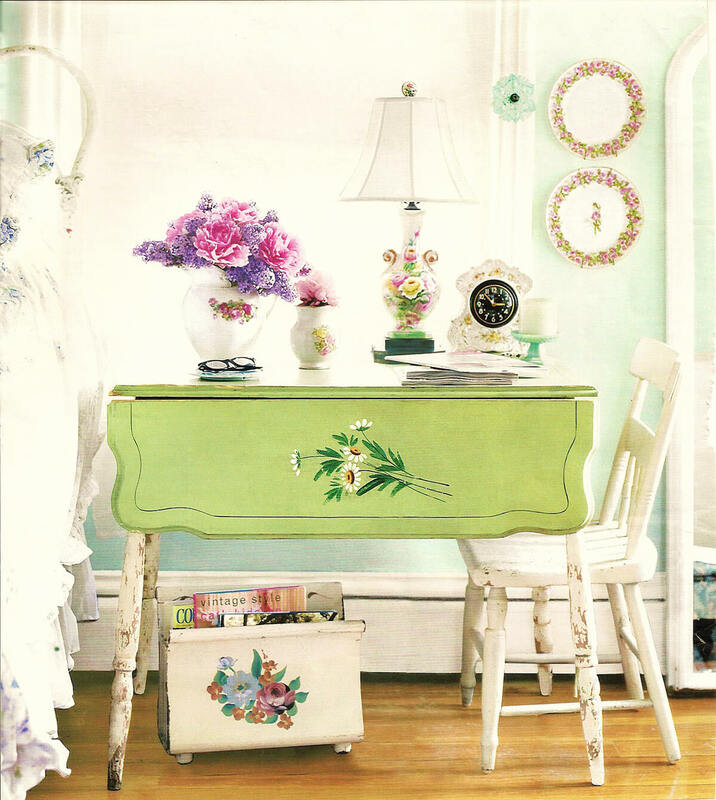 The distressed legs and pretty green color with a flower accent give the desk a vintage and elegant look. Top the table with pretty items featuring floral designs to finish off the look. 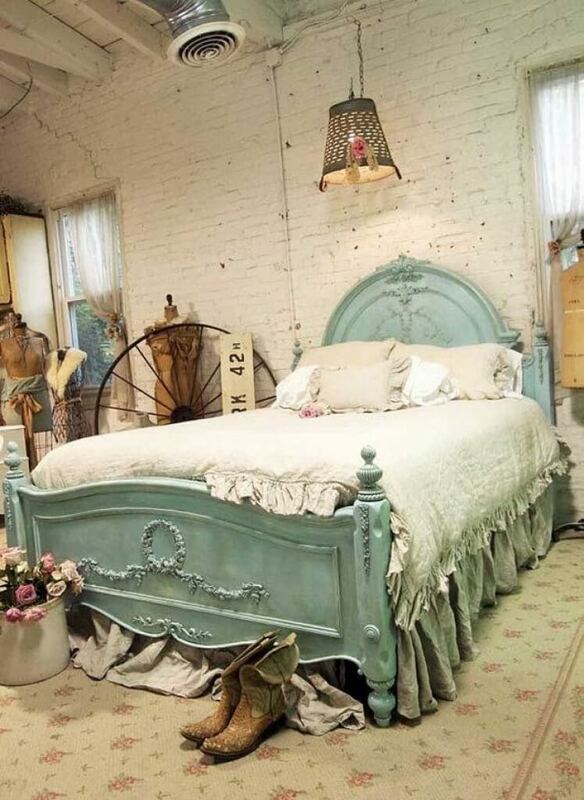 Make this painted vintage bed frame the centerpiece of your shabby chic bedroom. Paint the frame in this dusty blue color or choose an accent color to match your existing decor. Sand down the frame after painting to give your bed a distressed look and to make the accents on the frame stand out. Roses are a classic decor element for any shabby chic design. 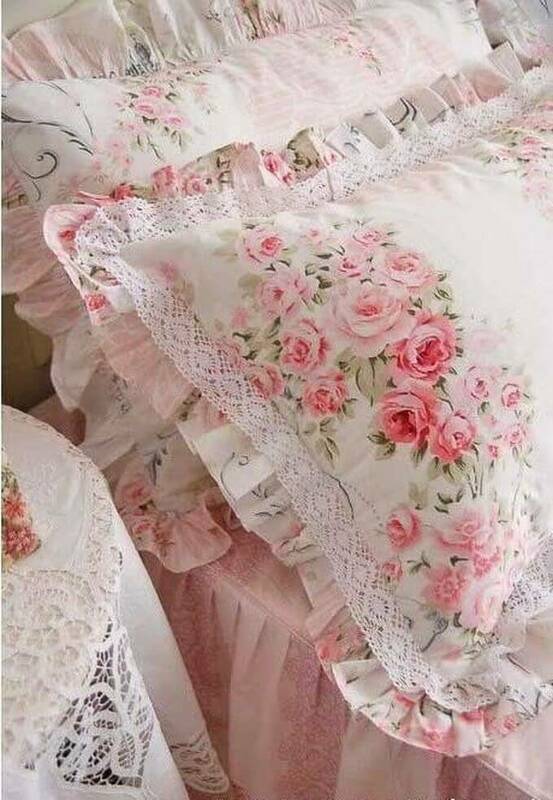 These pillow shams with combine this classic look of beautiful pink roses with the elegance and vintage feel of ruffles and a lace outline. Use these pillow shams to enhance your shabby chic bedspread or to add a bit of vintage flair to a plain bedspread. Add this canopy above your bed for a soft, romantic feel, or create a beautiful addition to a nursery or little girl’s room. To create this look, use a hoop mechanism to hang a gauzy mosquito net from the ceiling or wall, then drape fairy lights down from the top for a soft lighting effect. Create a beautiful seating area in your bedroom with a wicker chaise lounge accented with these pink ruffled throw pillows. The pretty pink color of these pillows makes them an ideal addition to a bedroom filled with pink and crystal decor items, while the texture gives your bedroom a unique look. 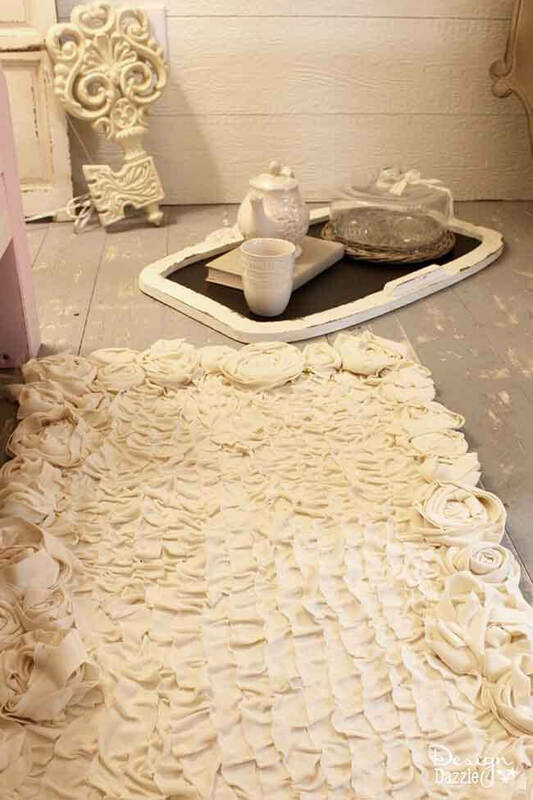 Make a textured and comfortable spot on your bedroom floor with this DIY rug with ruffled fabric and homemade fabric rosettes. After creating the fabric rosettes, hot glue them onto the edge of the fabric rug, then attach the remaining fabric pieces to the middle of the rug in a ruffle pattern. Create a beautiful set of accessories to decorate your little girl’s nursery or bedroom with these DIY projects. 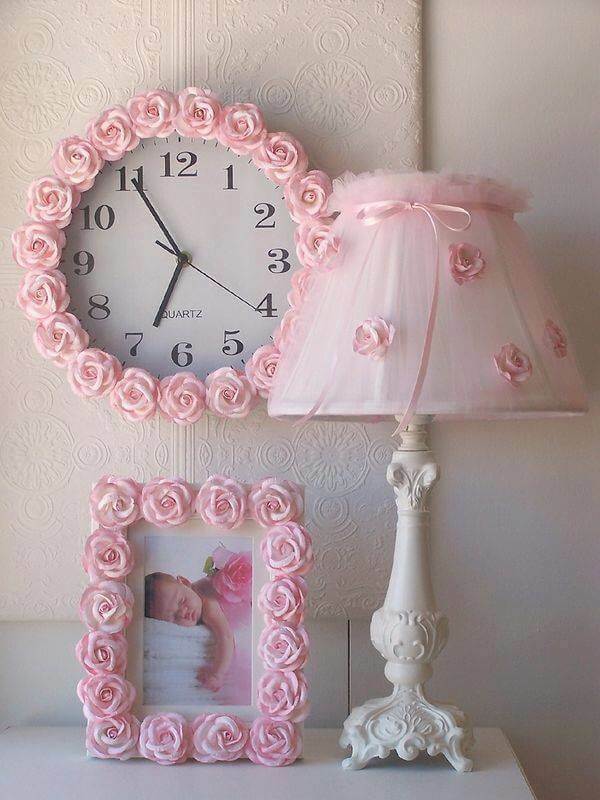 Glue pink or any other color rosettes onto an existing frame and clock for easy wall or table accents. Finally, take a pretty white lamp with elegant details and add pink gauzy fabric, small rosettes and ribbon to the lampshade. 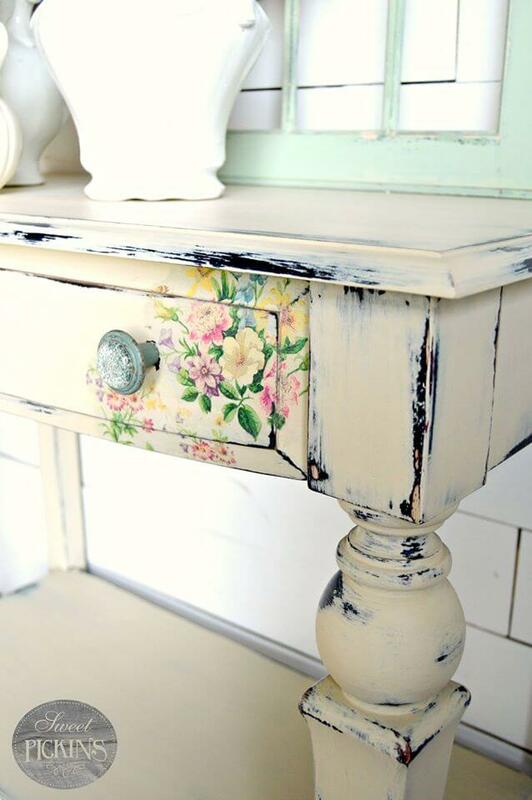 Combine a distressed look with pretty flower accents by placing this painted wood desk in your bedroom. Use a specialized white paint that naturally chips and crackles in random places on the desk for the distressed, antique look. Paint on the flower detail using a stencil to add a splash of color and freshness to the desk. 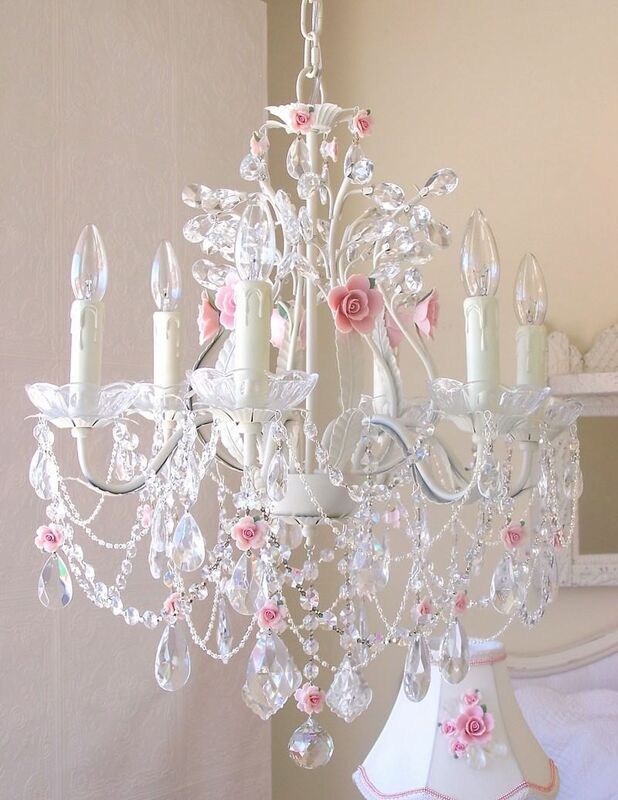 Turn your little girl’s room or nursery into a fairy tale setting with this white crystal chandelier accented with pink porcelain roses. The chandelier is draped with multiple crystal teardrops and chains of crystal for a romantic look fit for a princess that will make her room shine and sparkle. For an easy accent piece on a tabletop, desktop or bookshelf in your bedroom, find a glass vase with an elegant and simple design. 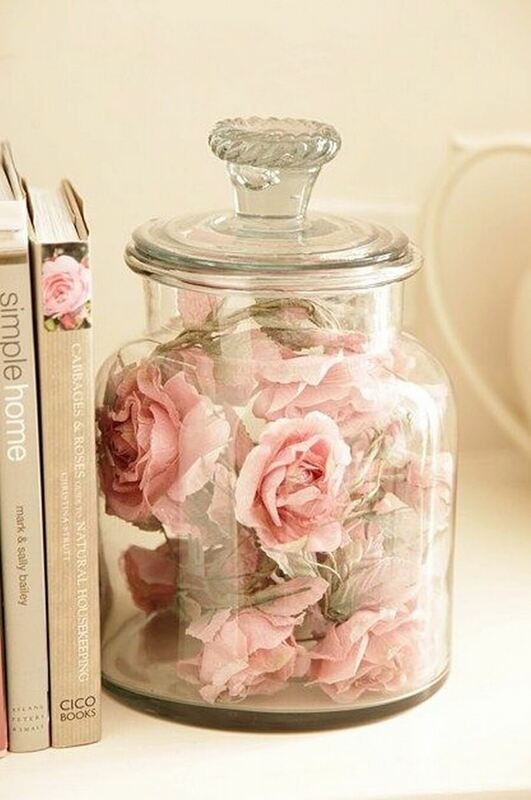 Fill the vase with fabric or real flowers of your choice, although a few pink roses are perfect to achieve a shabby chic look in your bedroom. 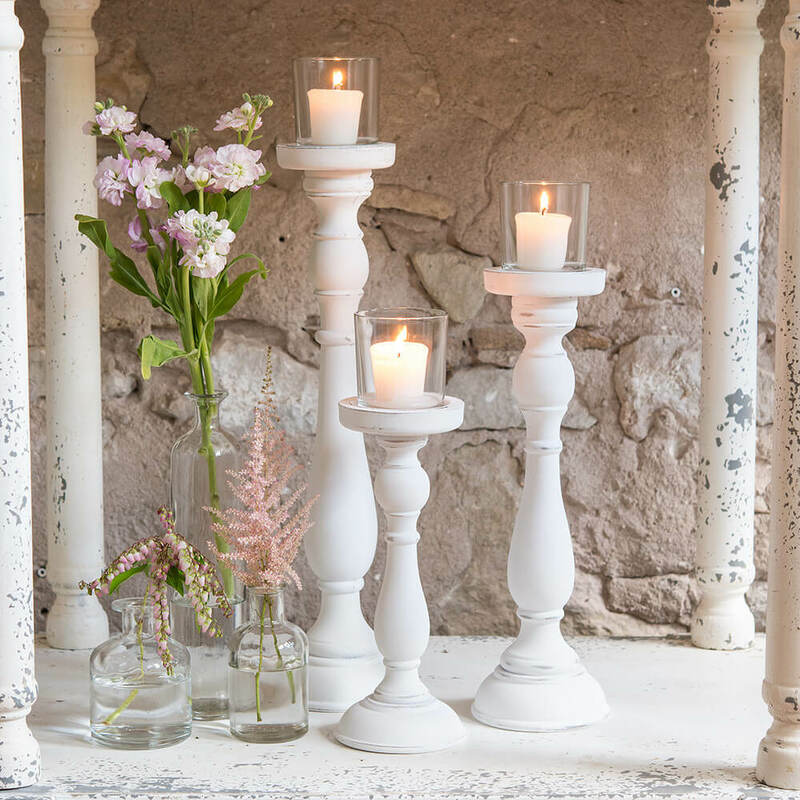 Turn old candlestick votive holders into a romantic decor element by painting the candlesticks white, and sanding them in certain areas for a distressed look. Use the candlesticks to display small, white votive candles for some soft, elegant lighting. Group the candlesticks together and pair them with some vases filled with fresh flowers to enhance the romantic feel. Transform a simple lamp into a beautiful addition to your bedside table with some distressed paint effects and fabric flowers. To make the fabric flowers on the lampshade, simply form the fabric into swirls and flower shapes and hot glue them to the shade. This gives you an easy textured look that pops on a distressed bedside table. Fairy lights are an easy way to give your bedroom a fancy look, and this DIY headboard is no exception. Paint some antique doors to match your bedroom and prop them behind your bed or mount them to the wall. Finish the look with a draping of light fabric covered with string lights. Even the littlest accent piece can bring together the look of your shabby chic bedroom or nursery. 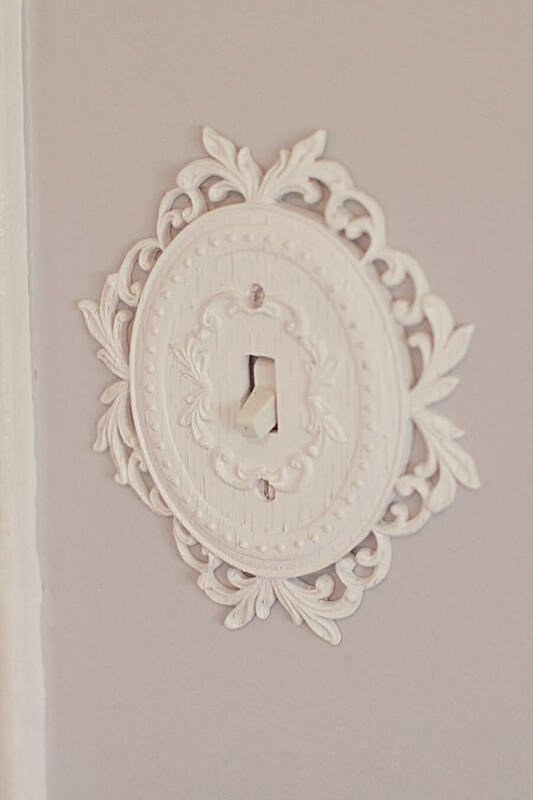 Find a switchplate with a beautiful and elegant design and paint it with white crackle paint for a distressed look. This DIY project ensures that even your light switches bring a touch of elegance to the room. Enhance the look of your shabby chic bed set with this easy upcycled window decor to hang on the wall. Find an old window with panes, and give it a fresh coat of white paint. Remove the glass panes if they are still intact, and replace with a delicate, floral fabric that mimics the look of curtains. Combine the look of romantic candlelight with a vintage and distressed look by displaying these antique lanterns in your bedroom. 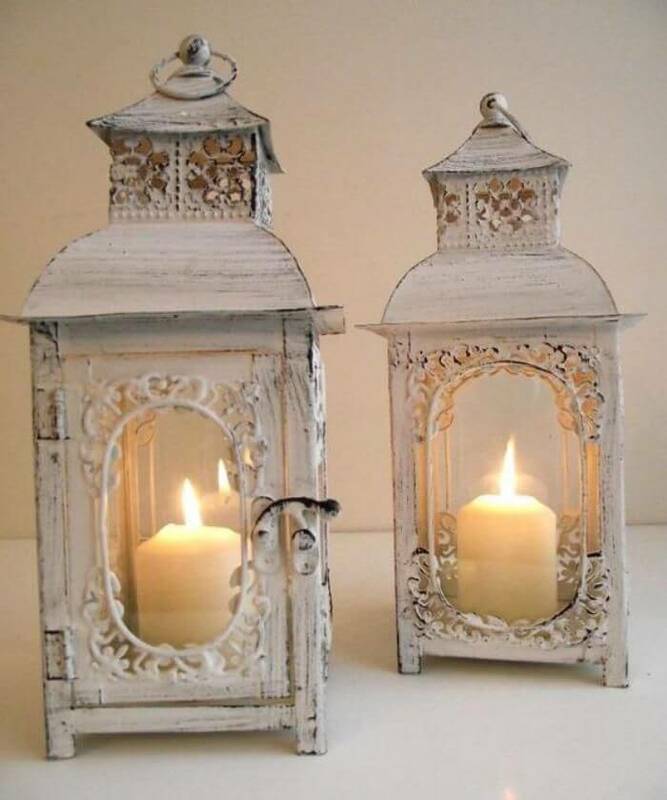 The distressed white paint is the perfect backdrop for the flickering candlelight inside the lantern. When choosing antique lanterns, try to find ones with delicate details and simple floral designs. Find a place to store all of your extra linens, while bringing a touch of vintage charm to your bedroom with this upcycled amoire. The elegant detailing on the top of the amoire, paired with a fresh coat of white paint, makes this piece both simple and fancy. For an extra vintage flair, cover the opening with chicken wire. 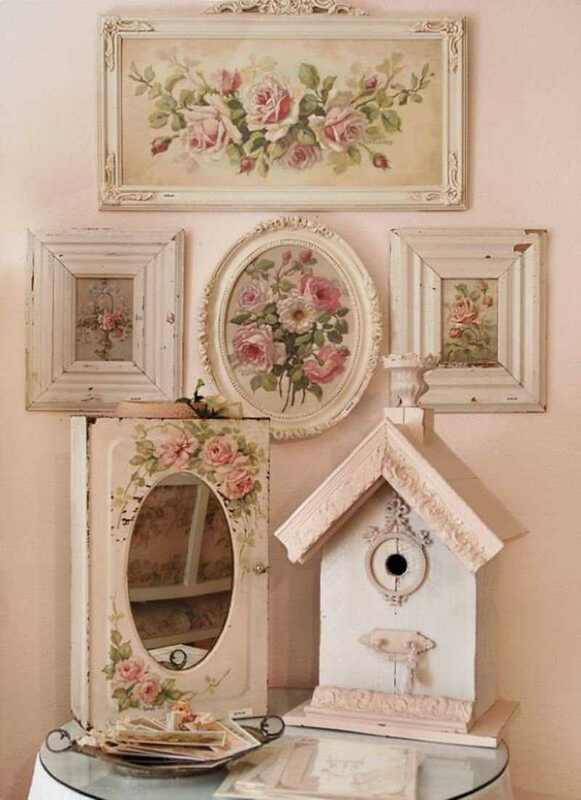 Create a beautiful gallery wall with a combination of vintage white frames and floral patterns. Find old frames with antique, elegant detailing, paint them a cream color, and do some sanding for a distressed look. Fill the frames with floral fabric, or print out beautiful floral images on antique paper. 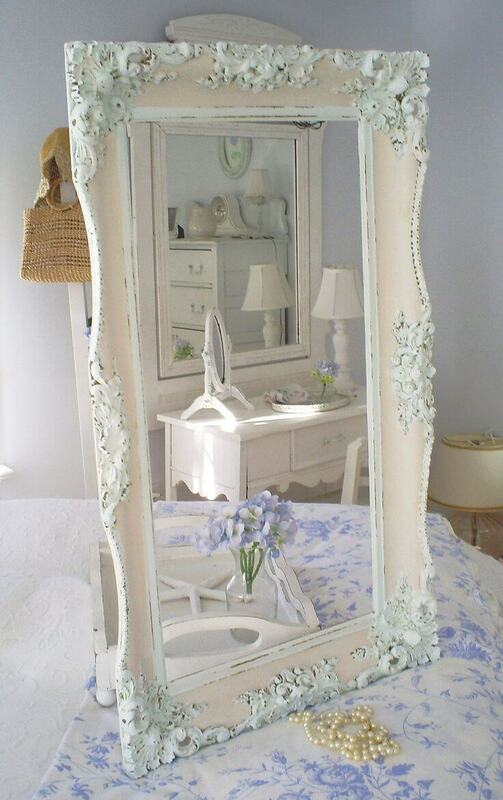 When decorating your shabby chic bedroom, adding some floral decor is never a bad idea. This vintage frame is the perfect complement to a fabric or fresh floral arrangement. For a simple look, use white paint and an arrangement of white flowers, then add a homey quote for an added coziness factor. Turn an old ottoman or stool into a comfortable and decorative piece of furniture in your bedroom. Choose a complementing set of fabrics in a variety of patterns and colors and layer them over the ottoman. Add some accent ribbon or small rosettes in a matching color to complete the look. Upgrade a plain lamp into a sweet accent by making this DIY fabric rosette lampshade. 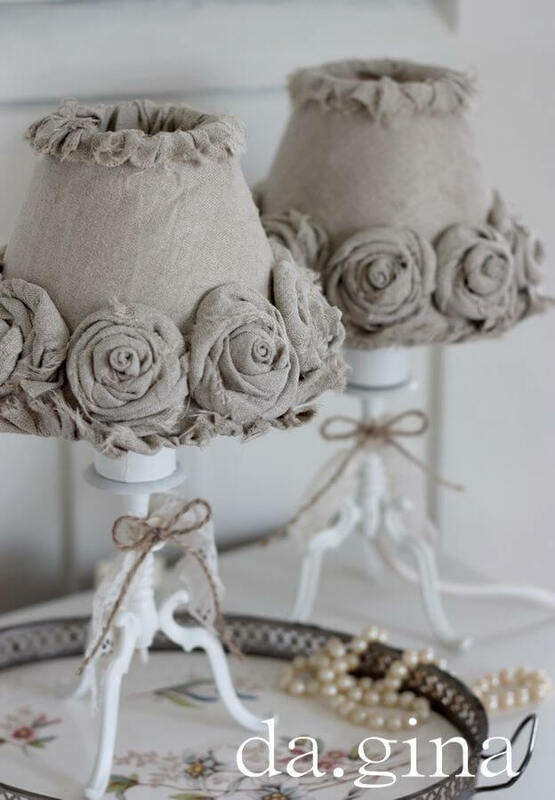 Grab an old lamp and give it a fresh coat of paint, then cover the lampshade in a light gray fabric. 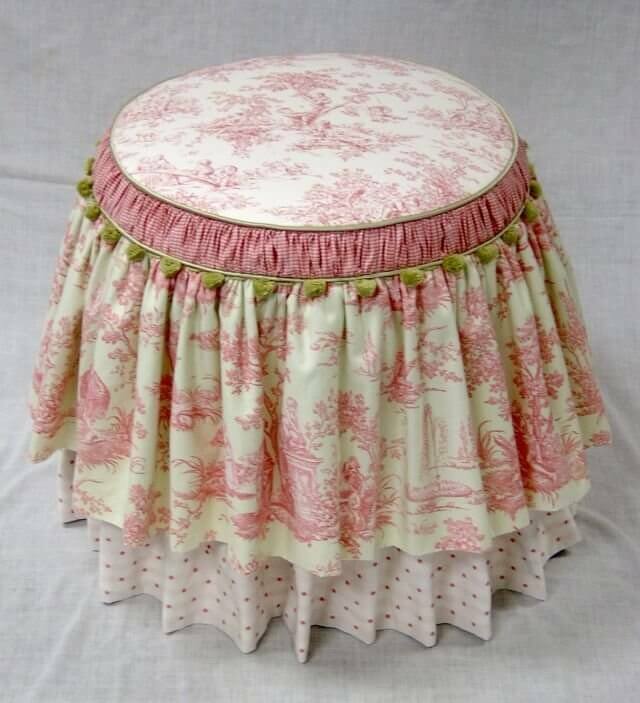 Use the same fabric to make rosettes, and attach them to to the bottom of the lampshade. 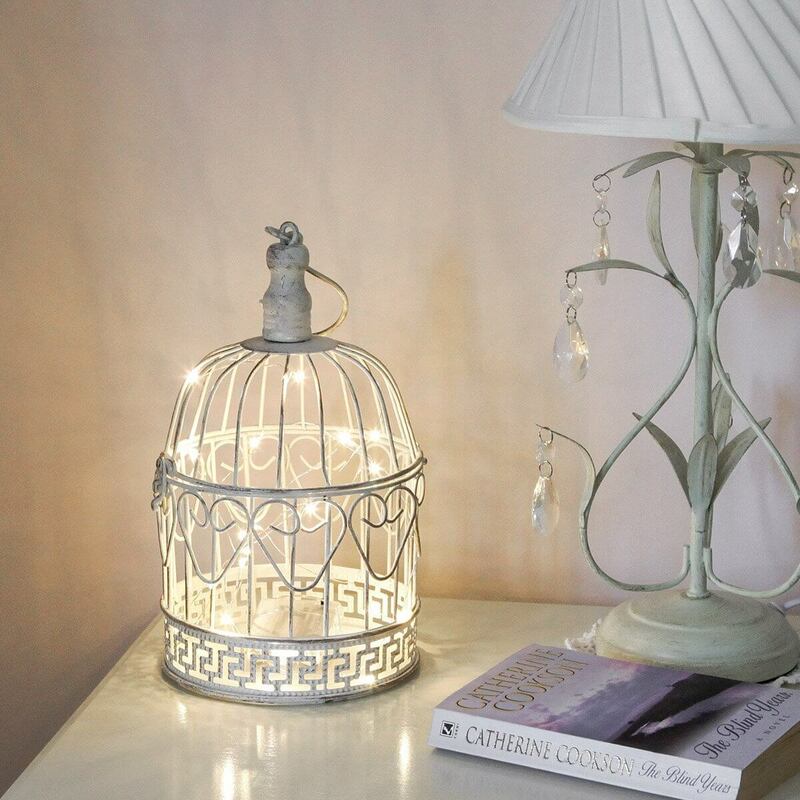 Upcycle an antique birdcage into a rustic lighting element in your shabby chic bedroom. Paint a standing lamp post and the old birdcage to give both a distressed feel, then attach the birdcage to the lamp post. 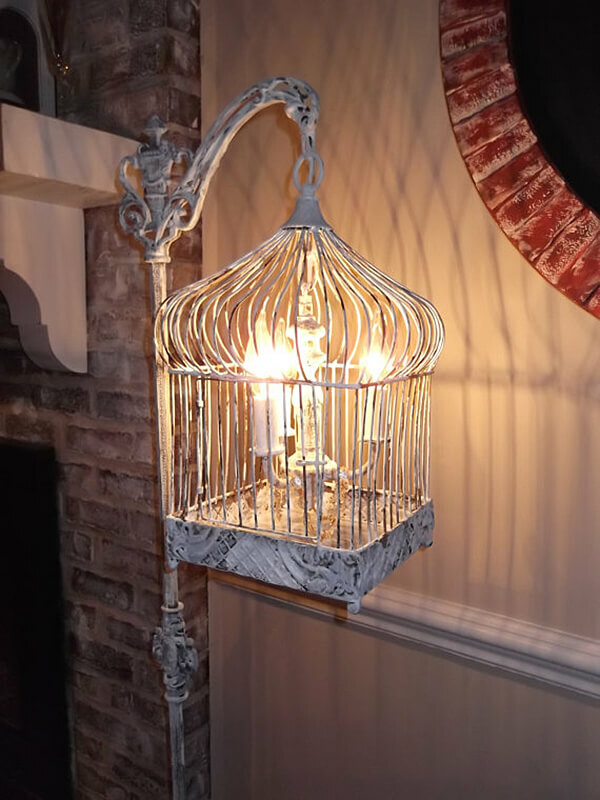 Add an elegant candelabra inside the birdcage for a touch of romantic lighting. Even old kitchen tools can be made into a beautiful decor piece for your bedroom. 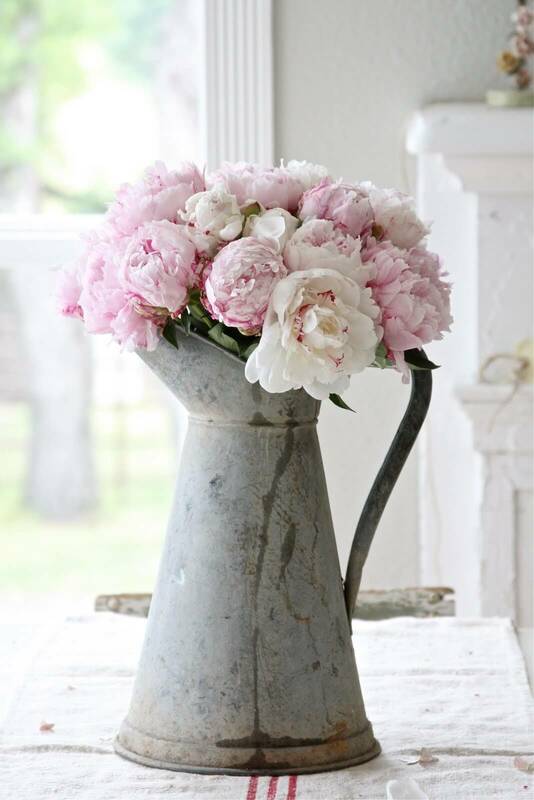 Use an old tin coffee pot as a vase for a pretty flower arrangement, such as this collection of white and pink peonies. The tin material adds a rustic element to the delicate nature of the flowers, making it the perfect shabby chic combination. 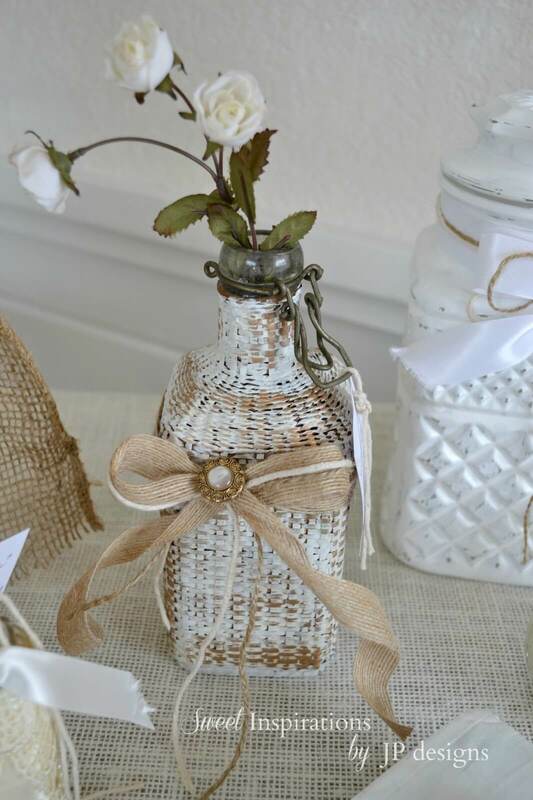 Turn an old glass bottle into a sweet vintage piece for your bedside table or desk by adding some wicker, burlap ribbon and an antique broach. Cover the glass bottle in a white wicker with some distressed areas. Tie some burlap ribbon of different sizes around the bottle and attach a pretty broach to the middle of the bow. 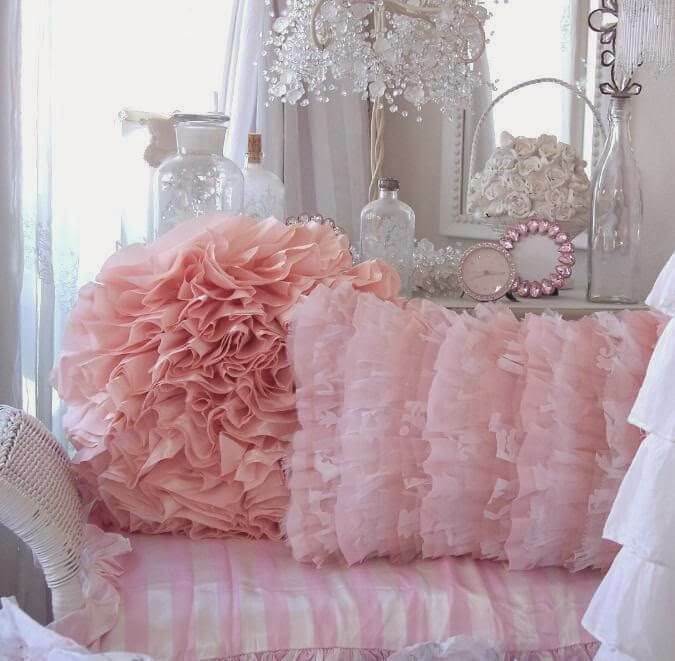 Whether you want to add a romantic feel to your own bedroom, or a touch of sweetness to your little girl’s room, this ruffled pink bedding is a great choice. 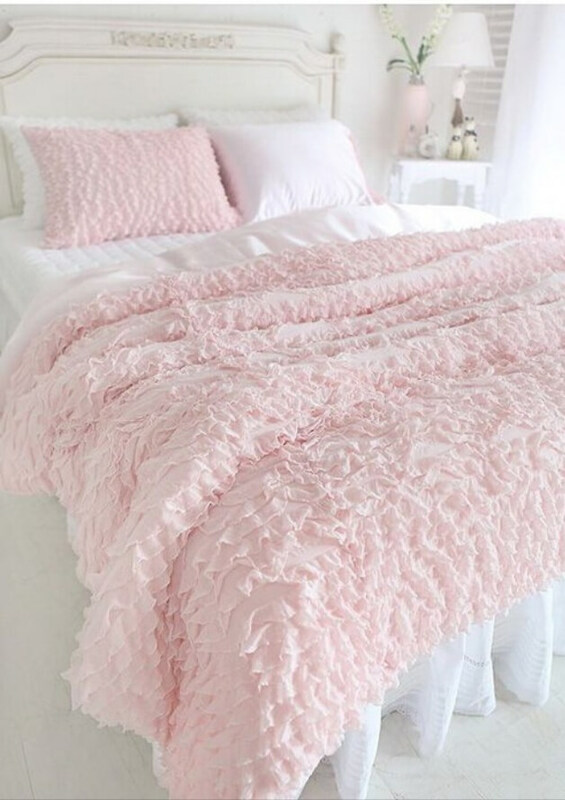 The ruffles of this duvet cover give the bed a textured look, while the light pink color brings a hint of sweet elegance. Create an easy surface in your bedroom by using this upcycled antique chair as a bedside table. You can keep the color of the chair intact or paint it and distress it to match your bedroom decor. Make sure the chair is sturdy enough to hold the basics, such as a lamp, vase and some reading material. An all white room with pops of distressed wooden accents combines the simplicity and rustic charm of a shabby chic style. 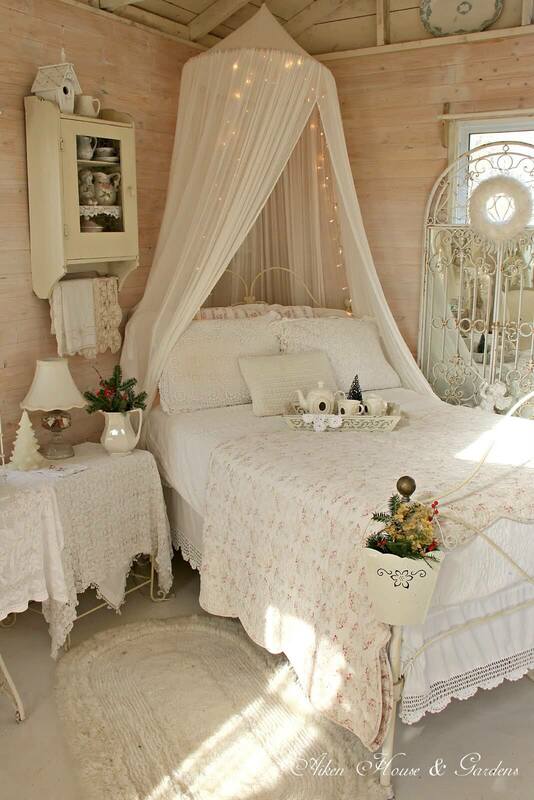 Use a combination of white wooden slats and lace draping as the backdrop for your bed. Hang a beautiful white and crystal chandelier, and place a distressed wooden bench at the end of the bed to complete the look.